Welcome! To Go Karts Rock! From GOKARTSROCK, we want you to enjoy your riding experience to the fullest, that is why we have decided to make this little guide where we will give you advice on how to pilot a kart. 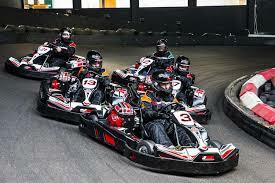 If you really want to have fun for our Spanish friends go here which is the home of this very fast indoor go kart Orlando track. Probably the best store on the internet fo go kart parts like Tony Kart, Vortex engines, and more is over at the USA KArter Warehouse Shopify store. You must have the best karts if your going to win!! Surely on the occasions that you have had the opportunity to fly a kart, you have had some kind of doubt about how to fly it. To skid in the curves ?, to brake before the curve ?, to brake in the curve ?, how does it affect the position of my body ?, and many other questions! We will try to satisfy your curiosity and desire to learn through this guide by chapters on how to run in karting. In the world of Karting, as in the rest of motor competitions, an optimal physical preparation is needed. It is usually recommended to be as fit as possible to run in karting. The gravitational forces that a race driver has to endure are enormous, just look at the Formula 1 races to realize the tremendous efforts to which the pilots are subjected. In the competition with Karts, which are the smaller brothers, the efforts are much smaller, but the essence is the same. A rookie driver, after running in karts in a circuit, will surely say that “it seems they have beaten him”, it is true. The car has given him a real beating because he is not fully prepared for the physical demands that driving a kart entails. It is about mastering the Kart, not that he dominates you and, for this, it is highly recommended physical form to withstand the swings, braking and acceleration. Now we are going to try to demystify a little the weight of the pilot. Surely many times you have engaged in some discussion about karting techniques and have touched on the issue of whether the weight of the pilot has a great influence on the karting races. If the more weight you have, the better to drive the car when cornering; or that if with less weight, the car has no stability; and many other theories. Well, that a pilot weighs more or less does influence for good and for bad. At the moment of accelerating when leaving the curves and in all the straights, the weight plays a fundamental role since, the less weight a pilot has, the more acceleration his car will have and consequently, before it will reach its top speed. It is a very important factor, since the engine of the Karts is much more limited than that of other racing cars. And when it comes to entering a curve? What role does the weight of a Karting driver play? In the next chapters of this guide on how to pilot a Kart, we will deal extensively with the subject of how to approach curves. For now, we briefly comment on how the weight of a pilot influences when negotiating curves. The Karts lack differential and suspension so when you take a curve, the inner rims (in a left curve are the front and rear left wheels) roll at the same speed as the outside, so the kart tends to go straight . This is where the movement of your body and weight play a very important role: if at the beginning of the curve you make a movement with your body outwards, the inner rear tire loses grip and allows the kart to take the curve faster by reducing the friction and inertia related to that rim, so by imposing more weight of our body outward, faster we will roll in the curves. But as we have said, these technical aspects are going to be dealt with more extensively in an exclusive chapter about curves. The karts weigh relatively little with respect to the weight of the pilot. So the weight of the pilot has an important effect on the way the car behaves, it is best to be clear about the idea that you are part of the kart, understand how the distribution of your weight affects each situation: entry into the curve , during the curve and at its exit. Once you master this technique and the rest of the karting tips, your times will improve a lot. TAKE CONTROL OF THE MACHINE! Sit well, child! How many times have we repeated this phrase at home, right? Well here we make it one more! As we have seen, posture (and weight) are two fundamental aspects when running in karting. Avoid the temptation to lean forward at the wheel or take off your rear seat. These actions negatively affect acceleration. The Birel karts have seat and pedal controllers. Each pilot must find his optimal position in which he can reach the pedals and the steering wheel without effort. The steering wheel must be held firmly, do not cross your arms in curves and do not let go under any circumstances. You have to hold the steering wheel firmly to master the direction of the kart in the corners.